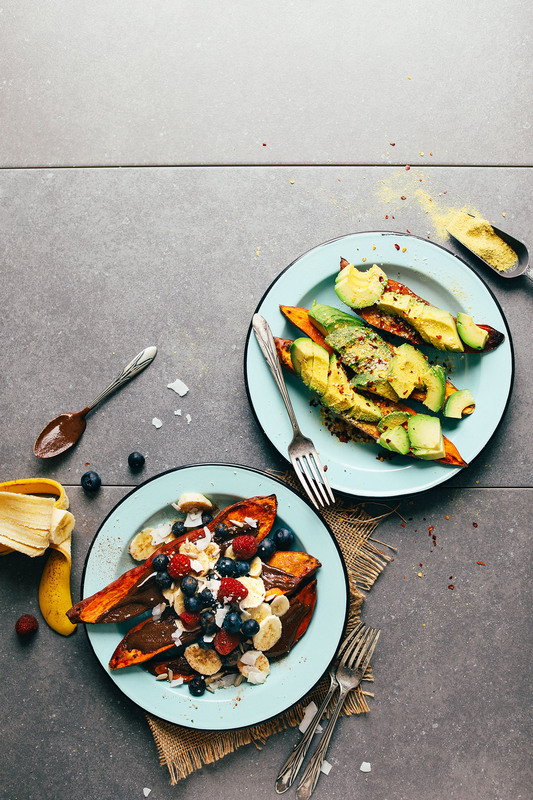 When I quizzed you all on Twitter about what kind of recipes you want to see more of on Minimalist Baker, the overwhelming majority of you said healthy, savory entrées! You are my kind of people. Not to worry, there will still be desserts – there will always be room for dessert. 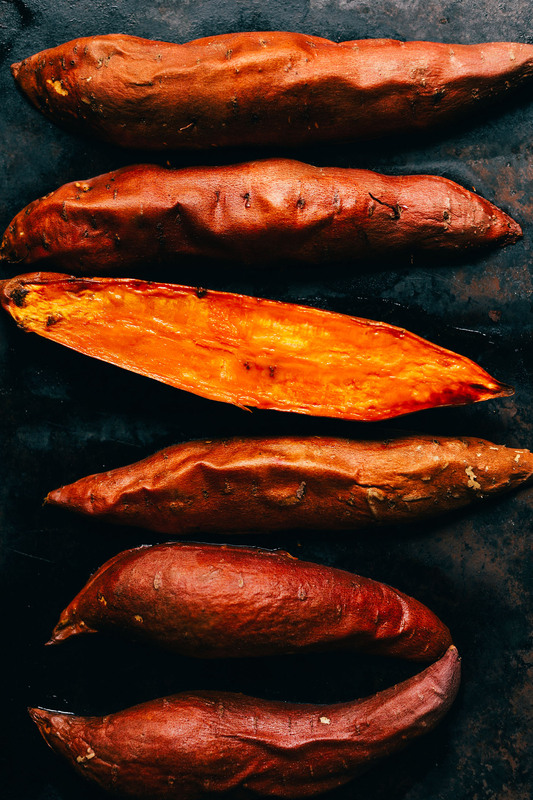 But I’m excited to continue adding healthy, easy, plant-based meal ideas, starting with my go-to meal when I don’t feel like cooking: baked sweet potatoes (just 30 minutes required)! I included two varieties of sweet potatoes: 1 sweet, 1 savory. For the sweet version, I went with my 4-ingredient Vegan Nutella (! ), bananas, berries, coconut, and cinnamon. This is the perfect “dessert for a meal” type of recipe (if you’re into that sort of thing – I certainly am). And for the savory version, I went with my beloved combo of avocado, nutritional yeast, sea salt, and red pepper flake. I also added hemp seeds for more healthy fats, fiber, and protein. This is inspired by my go-to Avocado Toast recipe, and it leaves me satisfied every time! If you’re into sweet potatoes, be sure to check out my Mediterranean Baked Sweet Potatoes, 1-Pot Sweet Potato Kale Curry, Cajun Sweet Potato Fries, Sweet Potato Wedges with “No Honey” Mustard Dressing, Sweet Potato Breakfast Hash, and Sweet Potato Lasagna! If you try this recipe, let us know. 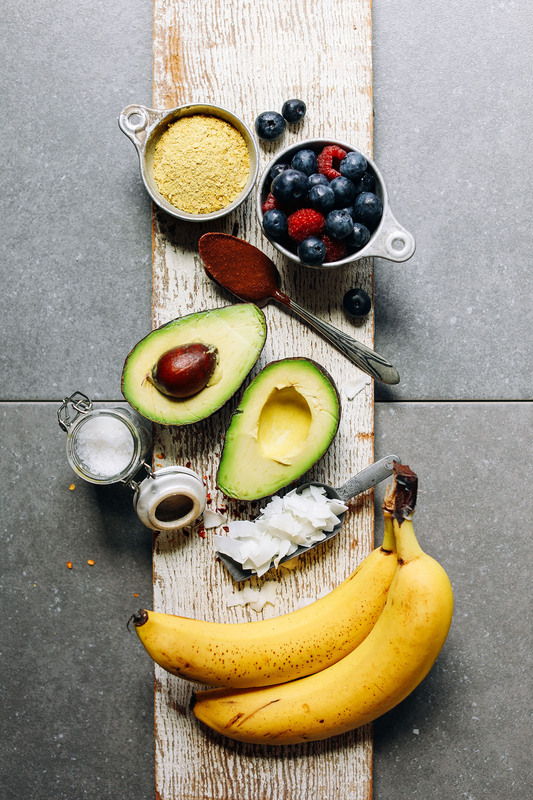 Leave a comment, rate it, and tag a photo #minimalistbaker on Instagram so we can see what you come up with. Cheers, friends! 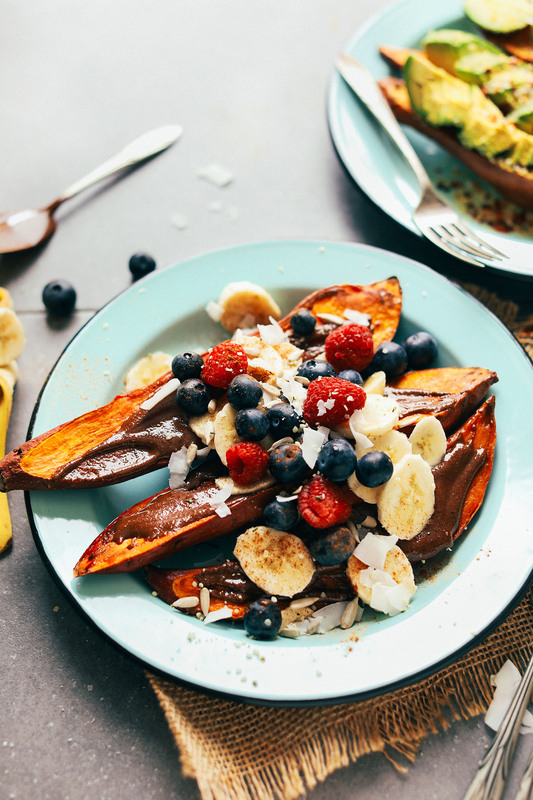 Easy, healthy baked sweet potatoes two ways - savory and sweet! The perfect 30-minute, plant-based meal or snack when you don't feel like cooking. Preheat oven to 400 degrees F (204 C) and line a baking sheet with parchment paper. Rub sweet potatoes with a bit of oil and place facedown on the baking sheet. Bake for 25-28 minutes or until tender to the touch. Baking time will vary depending on size of sweet potato. Once sweet potatoes are baked, turn faceup and place on serving plate(s). For the sweet version, top with nut butter, banana, blueberries, cinnamon, salt, and a bit of flaked coconut. For the savory version, top with avocado, nutritional yeast, salt, hemp seeds, and red pepper flake. These sweet potatoes make the perfect lazy meal when you don’t feel like cooking. They’re ideal for breakfast, lunch, or dinner! You can also make sweet potatoes ahead of time, store in the refrigerator up to a few days, and reheat in a cast-iron skillet on the stovetop, in the microwave, or a 350-degree F (176 C) oven. *Nutrition information is based on 1 SAVORY sweet potato with half avocado. You are my favourite foodie newsletter…recipes are amazing. Have made several now. We’re glad to hear that, Diana! The recipe calls for sweet potatoes, but these are yams pictured. Sweet potatoes are yellowish inside. Yams are very orange and the skins are redder than sweet potatoes. There is a difference in taste as well. Can you clarify this in your recipe? Thanks. Both sweet potatoes and yams will work in this recipe! OH MY GOD i made the sweet one and im eating right now! let me tell you its amazing! i put my own almond butter and cacao nibs on it though becuase i didnt have those other toppings but im super impressed! This was yum, thanks Dana! 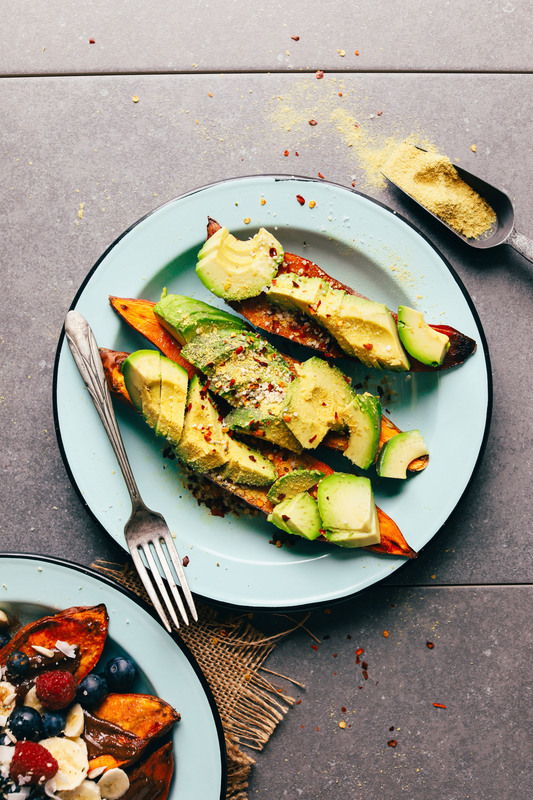 I used some of the other commenters’ suggestions and topped mine with avo, nooch, paprika, garlic powder, seasoned salt, hemp seeds and red pepper flakes. It made a really hearty breakfast! One question please: my potatoes seemed quite wet. I did bake them for 40 minutes as they were large. Would they come up better if pierced before baking? Easy and satisfying! 3-year old vegan kid approved. We made the savory. I was out of hemp hearts so we took another commenter’s idea and used pumpkin seeds. I also added a little Hungarian paprika and a teeny dash of garlic powder. I made extra sweet potatoes so we can have the sweet version for breakfast. I don’t care for hazelnuts so we’re going to go with almond butter. I’ll probably add chia seeds too. Thank you! 3-year old approved is huge! We are so glad your family enjoyed this dish, Nicki + great topping tips! Thank you SO much for this recipe! It was nourishing and absolutely magical. We tried the savory version and added paprika. <3 We are looking forward to trying more of your amazing recipes (and we totally love your fierce food photos! Keep 'em coming!). Husband and toddler approved! Subbed hemp seeds for pumpkin seeds and it was perfect. Your recipe was such a great inspiration! Surprisingly delicious and yummy!!! Made the savory recipe for me and my husband for lunch today and we both loved it! Can’t believe how yummy it was and how easy it was to make. I baked the sweet potato in the morning as I was getting ready for work and then just brought all the toppings I needed for the savory recipe to work. I also used some of the vegan Parmesan as a topping (my husband still can’t comprehend “nutritional yeast”) and also the nutritional yeast (1/2 on each side) – both were good! Will be making this recipe again! My hubby said, “good job making this recipe” ? Thank you Dana! I had 2 sweet potatoes I needed to eat and made both the sweet and savory versions for dinner. Absolutely delicious! Thank you!! I made these and loved them- so easy to prepare! A great weekday dinner. For those feeling something extra savoury, I made a quick chipotle dip just with vegan mayo (I used vegenaisse) and hot sauce. It was super tasty to dip! I make sweet baked sweet potatoes so often! I usually spread peanut butter, berries, turmeric, cinnamon, and granola on top for an extra crunch! Everything tastes amazing! These were sooo good! I took these to a lake house party and everyone ooohed and ahhed over them! I baked the sweet potatoes beforehand and assembled the savory one for dinner, and the sweet one for a snack. It’s such an easy and delicious recipe. I cannot thank you enough for making this recipe Ms. Dana! Sweet potatoes are my favorite and this totally hit the spot! **also tahini tastes great on this. I love this! I make a similar sweet version with homemade pecan butter and it gives me all kinds of fall-time feels :) so yum! 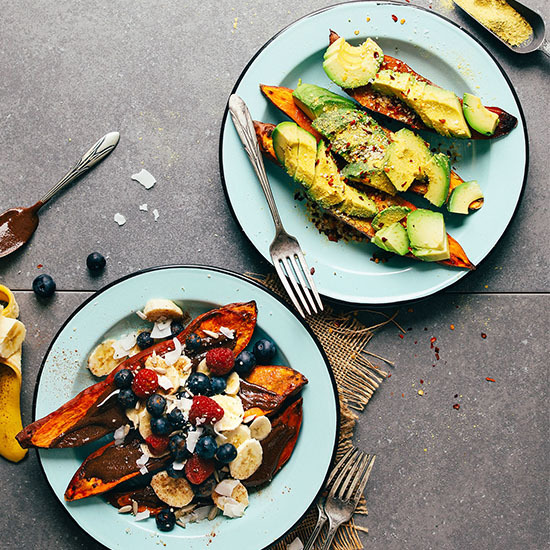 Thanks for sharing all your amazing healthy recipes, love your blog so much! These potatoes look incredible! I need them in my life! All of the recipes look so good that I just decided buy the cookbook! Looking forward to new meals. Just saw “What the Health” documentary on Netflix and immediately went Vegan. Cleared out the fridge today! Both of these are absolutely perfect Dana! Some of my favorite combo! I love how versatile sweet potatoes are! Do you eat the peeling and all? These look absolutely incredible!!! I’ve been on a berry+sp kick recently so I’m down with version 2 here!!! I made this and got immediately laid! Is the nutritional info for the savory for one avocado per person or 1/2 avo per person? Updated! Sorry about that. I think it was the calculation for two instead of one. Both Versions look amazing. Easy to prepare. I’ll be making these soon. Holy moly, these look good!!! The sweet version sounds perfect for breakfast. The savory version is calling my name. Love avo and sweet tater together!